Do you remember Boaty McBoatFace? Well that was a laugh. 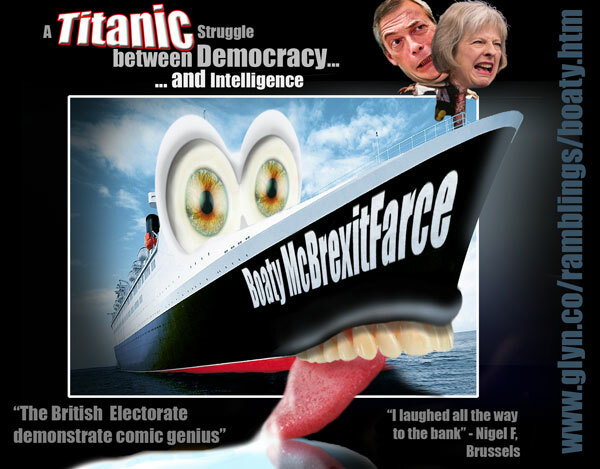 When offered a democratic choice to name a serious scientific vessel, Boaty McBoatface was the name the "Great British Voting Public" chose to get behind. That's how we roll. That's democracy in Britain. It endeared the vessel to the great public conciousness, and made us care about what was at the end of the day, a ship that non of us really had the slightest interest in. If I'd voted on the issue, rather than just laughing at the spectacle, I'd have voted for 'Boaty McBoatFace'. Which makes me wonder if that's why people backed Boris McBlowHard when it came to Brexit. I really don't know. I don't understand why people voted for Brexit. I've been trying to find out for the last three years, and I can't get a meaningful discussion out of anyone. Don't get me wrong, people have given reasons, but non which stand up to any level of scrutiny, and in the face of reasoned discussion... some have been known to become quite offensive. Such is life. Don't get me wrong, I can appreciate some people want to stick two fingers up to the "establishment" but not when the campaign to do that is being run by Boris and Rhese Mogg. It's a joke, right? It's just next level irony? I can't help but feel that the British people didn't demonstrate "democracy at its finest" when it came to Brexit, or if they are, then taking democracy at it's finest, certainly doesn't include taking it seriously. So when people talk about "respecting democracy", maybe we should talk about what we mean by 'democracy' first. It wasn't a discussion that was had prior to the referendum, so much as an emotional mugging. Boaty McBoatface starts to look like the better side of British democracy in comparison. At what point does the greater qualities of democracy include lying to convince as many people as possible. Is democracy about offering one thing, and then delivering another, or getting people to vote for a blank cheque, so you can deliver whatever you like. At what point did democracy become about Theresa May running down the doomsday clock until there are no other options available? Democracy could be about having an open and honest, meaningful discussion, where we explore and question the perceived facts, and then have an intelligent and informed vote afterwards. If you find yourself claiming people don't respect democracy, maybe we should focus on making our democracy respectable first. Because one thing I will categorically say about the UK is that our democracy is currently not respectable. If you respect this farce, why? So Churchill made a compelling argument when he stated that “Democracy is the worst form of government, except for all the others.” OK, we respect this, because we don't know a better way...but he counted his own argument when stating "The best argument against democracy is a five-minute conversation with the average voter." Maybe it's time we remembered that first point, and addressed the second, and stopped trying to ram this rather poor form of democracy the UK currently employs down people's throats. Maybe it's time we accepted democracy's limitations. Maybe it's time, we actually tried to improve how we communicate, and how we carry out our democracy, and started to look at it as a positive constructive process, and not an ongoing battle to be gamed and abused. Because currently in this country, there's no point in telling people they don't respect democracy, when they way democracy is being carried out, is far from respectable. But then, I don't need to tell that to the nation that voted for Boaty McBoatface. We're a country that gets irony, and that's what this is all about, right? Or did we just screw up really badly, and everyone is simply too embarrased to admit it?